These muffins were average. I’d make a few changes the next time. First, they weren’t nearly “spicy” enough for me. Obviously, not in a muy caliente sort of way. But in a pumpkin-y, fall, seasonal spicy sort of way. And I actually included allspice; a seasoning not called for in the original recipe. 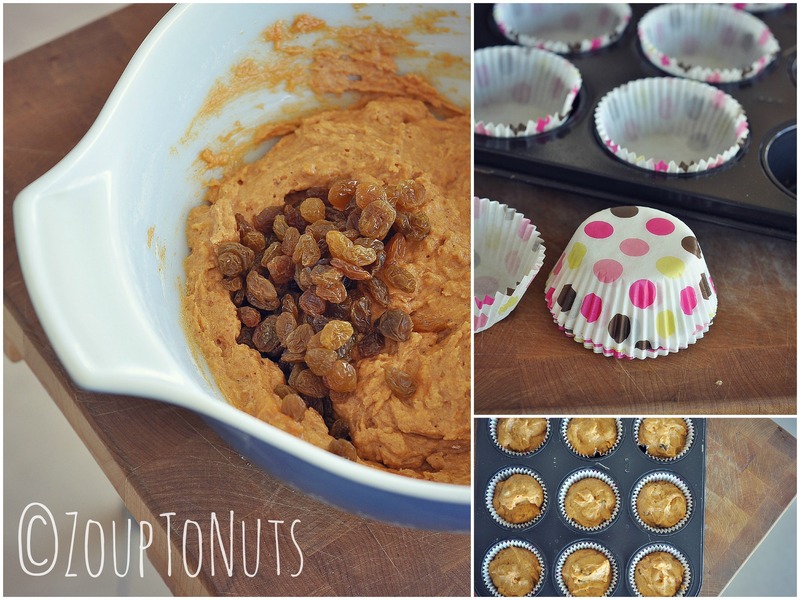 Also, as much as I love golden raisins, I didn’t love them in this recipe. Too mushy or something. The texture was wrong. See my Baker’s Notes below for some suggestions to improve this recipe. It has the potential to be really good. Feel free to comment, too, if you make them, and let me know what you did or didn’t do to change the recipe. I might like to try it. Enjoy! Pre-heat oven to 400°. 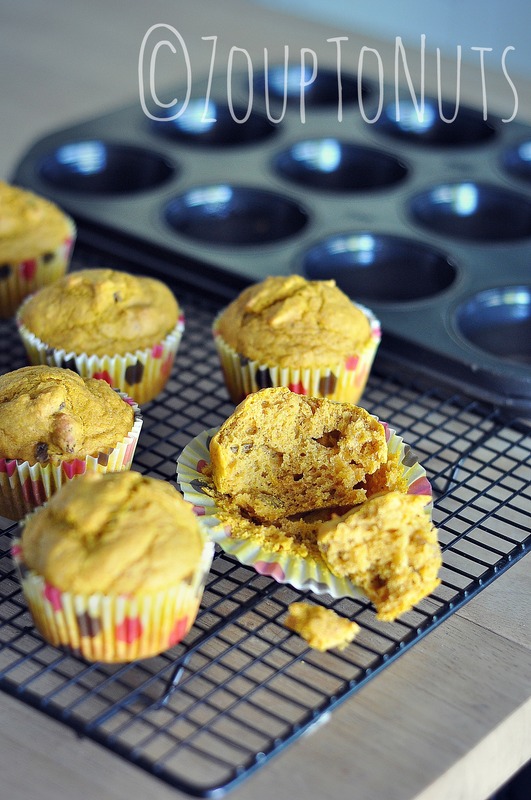 Spray muffin tins with non-stick cooking spray such as Pam for baking. In a bowl combine flour, sugar, baking powder, salt, cinnamon and nutmeg. Mix well. Cream butter and sugar. Beat in egg, milk, and pumpkin puree, until smooth. 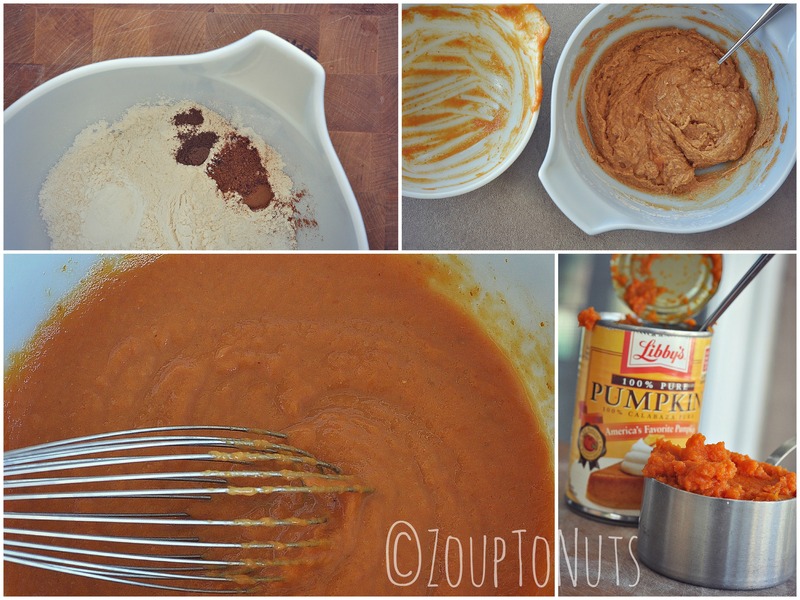 Fold dry ingredients in to pumpkin mixture, about 1/3 at a time, being careful not to over mix. Stir in raisins (or, walnuts). Spoon equal amounts into muffin cups and bake 15-20 minutes until lightly browned. Cool for 5 minutes in pan, then finish cooling on rack. ***Baker’s Notes – First, as you can see above, I used cupcake liners for my muffins. If you do this, make sure the muffins are completely cool before removing the paper. My first one (yes, I was anxious to try it) stuck miserably, but the paper on the fully cooled muffins did not. Second, add more spice. I’d double everything: 1 teaspoon each cinnamon and nutmeg, 1/2 teaspoon allspice, and throwing caution to the wind, 1/2 teaspoon ginger. They’re pumpkin muffins. They’re supposed to be overflowing with the flavors of fall. The original recipe just fell flat. Third, the raisins were too soft. I’d use nuts next time; walnuts, pecans, or even roasted, unsalted pepitas, for some complimentary texture. Last, what you don’t eat the first day, refrigerate.